I took a few weeks off from running. When I started again, I restarted at the beginning of week 3 in the Couch to 5K program. I had been running Monday and Wednesday evenings when I got home from work and Saturday mornings when I had the chance. The Saturday mornings were few. After running Week 4 Day 1 on a hot Wednesday evening, I decided to switch to early morning runs during the week. Luckily for me, the next Monday was Memorial Day, so I had some time to adjust my sleep schedule. In gear news, I got a Garmin fenix 5 during the time I took off from running. I love it! It replaced my Garmin Forerunner 220 and Fitbit Charge 2. I had been wearing both when I ran, and I found it annoying to wear 2 devices. 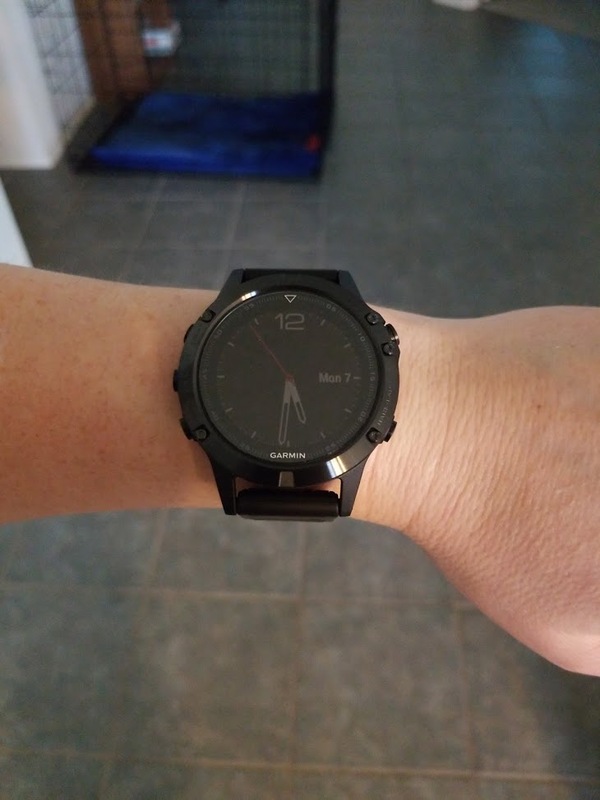 So far, I have only used the fenix 5 to track runs and Body Pump classes, but I’m looking forward to using it for hiking on our summer vacation. I decided to go with the medium-sized version, the 5, with the sapphire glass. The 5S is a little smaller and geared more toward women, and I considered it, but ultimately liked the look of the 5 better. I figured the 5X would look way too big on my wrist. The fenix 5 uses Connect IQ apps, and I admit I need to do a lot more exploring of those. The battery life has been great so far. I chose to pay a little more for the sapphire glass, because I tend to walk into walls watch face first.